This frame is made out of super durable stainless steel. This will definitely hold up to any abuse you can give it. To insert the plate into this frame, requires the bending of metal clips over the plate on the top and bottom of the plate. 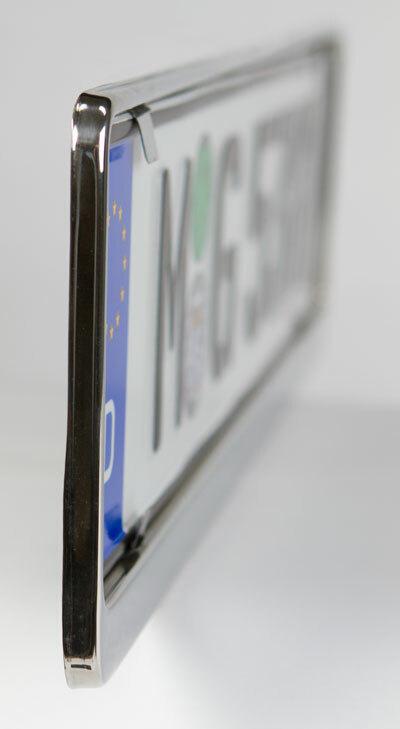 Since this plate is metal, it is automatically not curved, and will be very hard to shape to fit a curved bumper. This frame is only recommended for flatter bumpers. These frames can be bent if you are determined, however, we will not accept bent frames as a return.